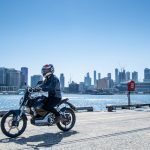 With storm cloud circling, some high profile celebrities in tow, and Port Melbourne Karting Circuit at our disposal, Honda Australia finally launched the down-under arrival of one its best-selling models worldwide. 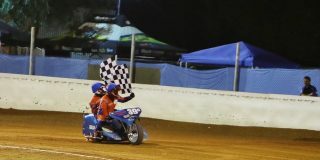 Along with myself and a select few other journalists were Honda superbike stars Jamie Stauffer and Troy Herfoss, Honda Motocross guns Dylan Long and Jay Wilson, plus V8 Supercar drivers Craig Lowndes and Rick Kelly and motorcycle GP racing legend Daryl Beattie. In the end the rain stayed away, the race was on for young and old, and the Groms gave as good as they got – massive grins all-round! Here’s what the press material says, and how close I reckon the hype is to the truth. The funky and compact Honda commuter that has taken the world by storm is coming to Australia. The Honda Grom has wowed riders all over the globe with serious fun factor packed into a simple, lightweight design. 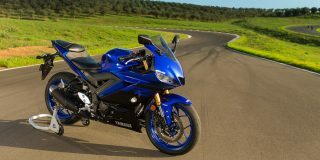 The popular pocket rocket promises to offer an exhilarating machine that anyone can master. Can’t argue with Honda’s opening fanfare for this latest in its long line of giggle inducing miniature motorcycles. The Grom is funky with a capital F.U.N., compact enough to stuff in the boot of a large family sedan, so simple a mechanical novice could rebuild it, and lighter than a Michelin-star soufflé. 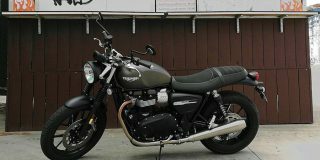 Not so much exhilarating as highly entertaining, but certainly one of the most easily mastered motorcycles that money can buy. The award-winning motorcycle boasts outstanding ergonomics that are all about fun. Between its user-friendly design and unique styling, the Grom is sure to be a hit. Which award you ask? The Grom was judged ‘2014 Motorcycle of the Year’ by American web-based publication Motorcycle USA. 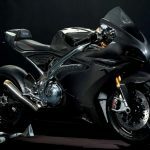 I’d say that this is a pretty big call when you consider the caliber and sophistication of many motorcycles available these days. But then again, it’s bikes like the Grom that remind us how motorcycling isn’t all about technology and hyper-performance, it’s simply about getting out and riding. 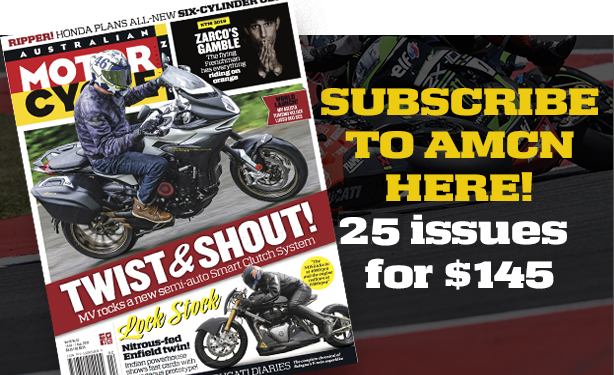 The fact is that worldwide the Grom is potentially getting more bums on bikes than all the high-tech high-performance bikes combined, and that certainly is award-worthy. 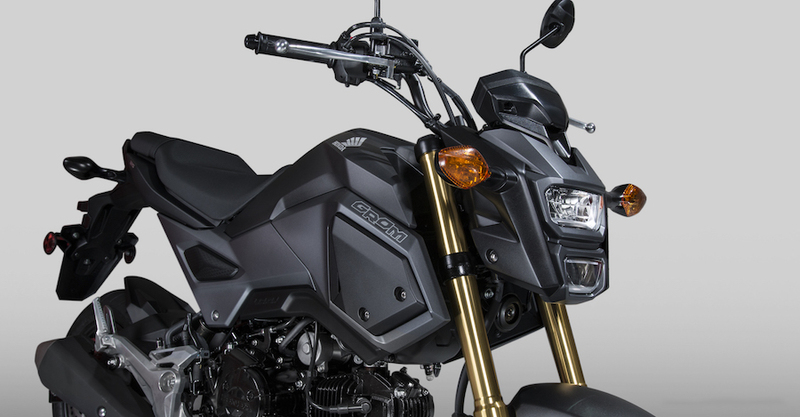 Priorities for the Grom were threefold: it needed to provide the base for a practical bike that new riders could use – and park – with ease in an urban environment. But it also needed to be just as useable and enjoyable out of town, and also readily accept a pillion. The Grom has a low 760mm seat height making it very manageable. If you can’t to learn to ride a motorcycle on the Grom, you’ll never learn on anything. The size, weight and power of a bike are the limiting and most intimidating factors when learning to ride. The Grom eliminates all these hurdles and presents motorcycling in its simplest and most accessible form. 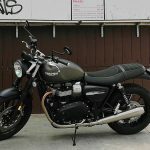 Again, for learners simply parking a bike can present problems, as maneuvering a big motorcycle into a parking spot at slow speed can be even more daunting than riding it up the road. Not so with the Grom, as it can turn within the total length of a larger motorcycle, and its centre of mass is lower than lizard’s belly. I’m not sure just how far out of town the average owner will go on a Grom, but there’s no reason why you shouldn’t. I reckon you’d have a hoot hitting the hills with a posse of Groms in tow. How long before the first ‘round Oz Grom attempt do you think? Although room is fairly limited for a pillion, it’s actually not as cramped as some bigger sportsbikes. And, at least on the Grom your bench buddy will be laughing and smiling along with you, as opposed to hanging on for dear life and screaming at you to slow down. Another aim for the Grom was to provide ‘beyond class’ suspension quality. 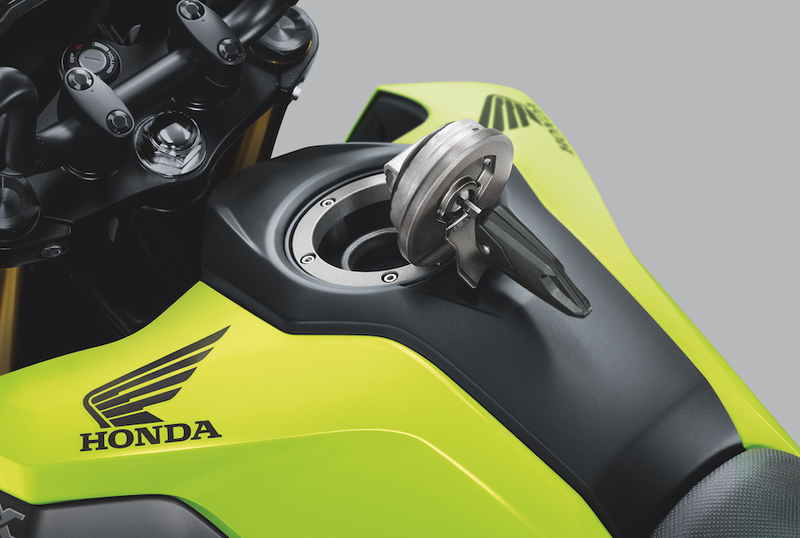 The 31mm USD fork – a first for Honda on a 125cc motorcycle – reduces unsprung weight and thanks to the pistons’ greater pressure-bearing area (compared to a standard telescopic fork) offers improved damping feel throughout the stroke. The top and bottom yokes are full-sized, further enhancing handling and rider feel while a lightweight and robust single shock operates a simple and tough H-shape, 50mm x 25mm steel box section swingarm. 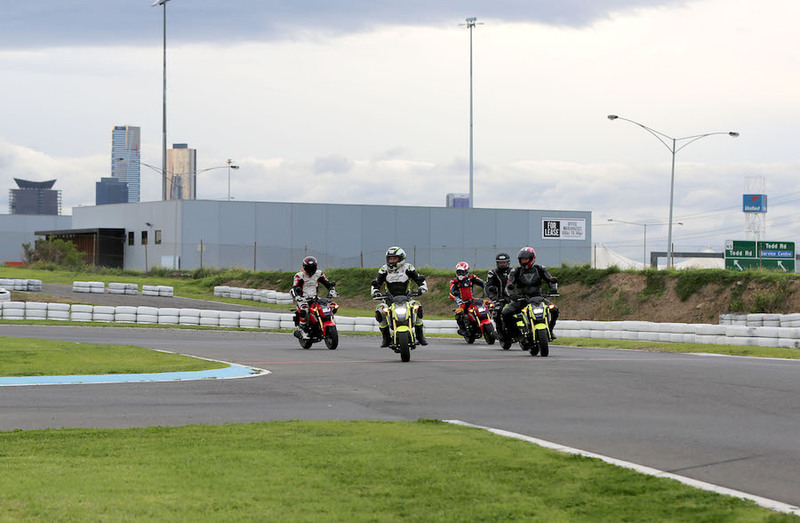 Bombing the Grom around Port Melbourne Kart Circuit with a grin like the cat who got the cream, I could help but be impressed with the quality of the ride and the things I could get away with. Although some people may regard it purely as a novelty bike, the Groms at this press launch were getting as much of a thrashing as they will ever get, and by some world class racers. Considering the Grom isn’t made for this sort of ten-tenths track riding, it performed remarkably well under the circumstances. Even sudden violent braking and steering inputs failed to catch the Grom off-guard. Out on the road in its intended environment, the Grom’s well-damped suspension excels at the relatively monumental task of maintaining control, which can mean battling potholes big enough to swallow a 12-inch wheel whole. The Grom’s well-proven and efficient 125cc fuel-injected engine provides a smooth ride and optimum power delivery, and also features a motorcycle-style four-speed gearbox and clutch. The Grom engine’s design has a lineage which can be traced right back to the earliest days of Japan’s mightiest motorcycle marque. No one does the fun-da-mental single-cylinder four-stroke quite like Honda, which is why there have been so many blatant Honda copies over the years. While its air-cooled engine may be archaic in some ways, fuel injection brings it up to date in terms of easy starting, power delivery and fuel efficiency. By stating that the Grom has a “motorcycle-style gearbox and clutch”, Honda means to assure us that this is not a twist-and-go scooter masquerading as a motorbike. 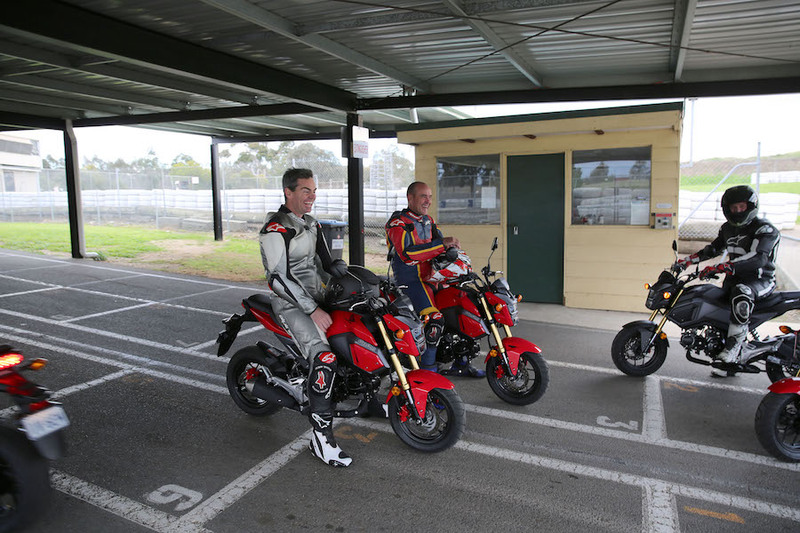 The significance of this is all the skills learned on the Grom, included using a manual clutch and gearbox, can be directly transferred onto a full-sized motorcycle. The irony here being that Honda produces more full-sized automatic bikes than anyone else! Fundamental to the Grom’s form and function are its 12-inch cast aluminium wheels, which feature wide 2.5-inch rims. New Y-shaped spokes not only look great they also save weight and the front 120/70-12 and 130/70-12 rear tyres also inject a different dynamic, both in terms of looks and performance. Hydraulic dual piston front and single piston rear brakes work front 220mm and rear 190mm discs. 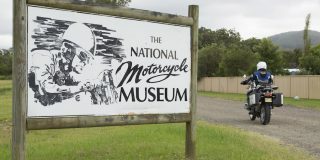 Much anti-scooter rhetoric from ‘real bikers’ is based on a prejudice against small wheels, something the Grom does share with the scooter world. 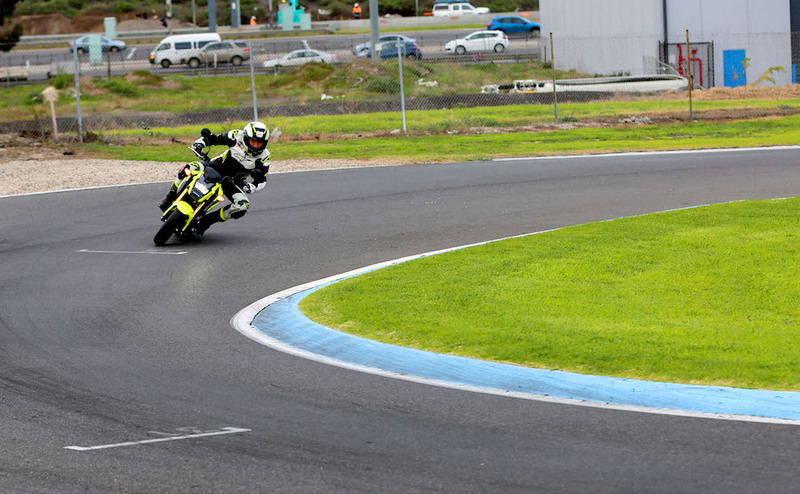 While its true smaller wheels are more of a challenge on rough roads and at higher speeds, performance and grip from the Grom’s 12-inch miniature supersport tyres radically outstripped all expectations. At full-lean it just kept on hanging on, and even allowing some controlled drifting as the ’pegs touched down and gently unweighted the rear tyre. 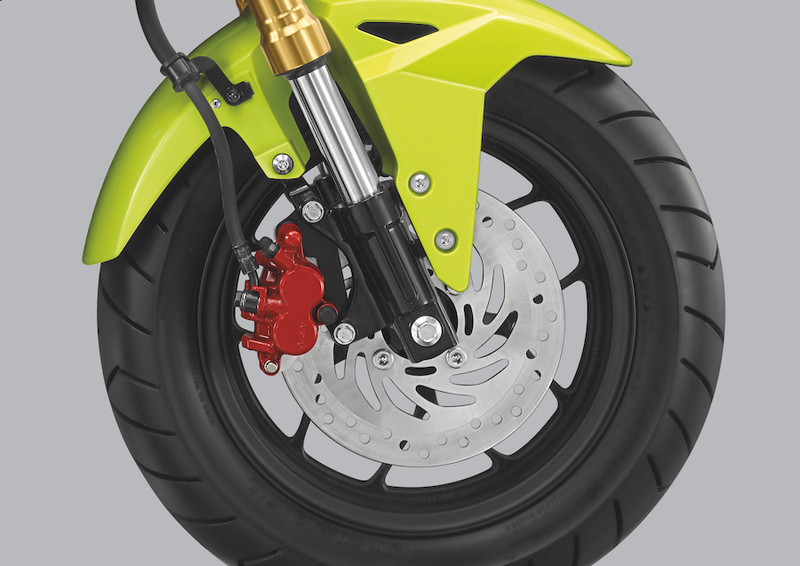 The Grom’s brakes are proportionately appropriate for its weight and wheel size, and worked well on the track with no fading under the extreme punishment they recieved. 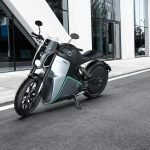 Easy to read for its compact size the LCD digital dash delivers all the information the rider needs – speedometer, twin trip meters, fuel gauge and clock. 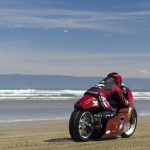 One of the downfalls of such a short and small motorcycle is that the dash is a long way from your natural line of sight compared to a bigger bike, so a glance to check your speed takes your attention away from the road for that fraction of a second longer. For this reason, its probably a good thing that there’s not too much info on the instruments, and that the speed readout is big, bright and easy to read. The mono-backbone frame structure also enables efficient storage of PGM-FI-related components and electrical parts inside the tank cover without reducing fuel capacity (5.7 litres). 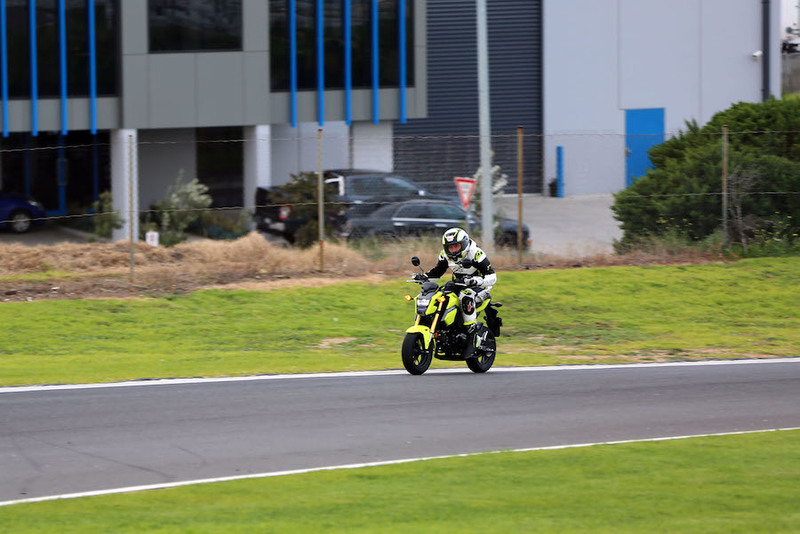 Doesn’t sound like a whole load of fuel capacity, but when you consider that Grom owners are reporting real world figures of 1.8 litres for every 100km – that’s over 300km on a tank-full for just six bucks – you know it makes cents! Small it may be, but in terms of worldwide sales, brand awareness and owner satisfaction, its impact has been very large. 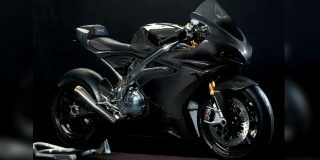 Oooh yeah, it’s the biggest little bike on the planet. Believe it! 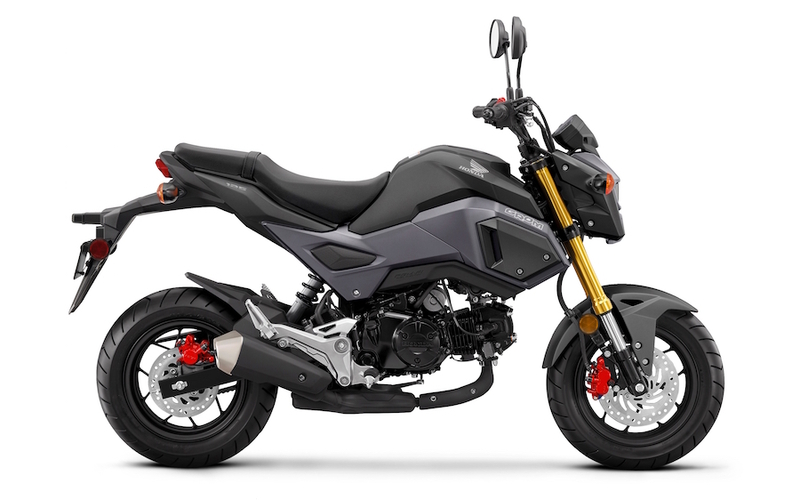 The Grom is available in Honda dealers now, and for a limited time you can pick one up at the launch offer ride-away price of $3999.